(Newser) – Some 85 years after the Volstead Act was repealed, Disneyland is joining the party. Come 2019, any visitor to the park of legal drinking age will be able to grab an adult beverage, CNN reports, noting that, currently, the only place to booze it up at Disneyland is at the "enigmatic and private" Club 33. 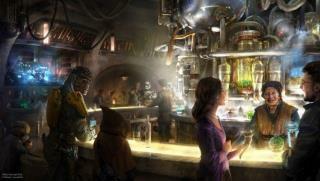 Starting next summer, per the Orange County Register, Disneyland will sell alcohol to the general public at Oga's Cantina, which will be located in the new Star Wars: Galaxy's Edge. How about in Epcot, they open a Netherland with a coffee shop /wink wink/. I would just like to add that Volstead is just another Minnesotan who is noteworthy for his tell me how to live government employee. I don't really see this ending well. Can't you take your kids out for a day of fun without getting lit? Wait 'til you get back to the hotel for the night and the kids go to bed.